At our home our “pets” are part of the family and we take their care quite seriously. So, it was with delight that we found a company who holds the same beliefs that we do. HandsOn Gloves Equine & Canine Grooming and Deshedding Gloves we designed for the grooming needs of our horses and dogs to be accomplished with care and offer an opportunity to bond with our animals while taking care of their need. HandsOn Gloves Equine & Canine Grooming and Deshedding Gloves ($24.95) are made of durable PVC and nylon, purposefully chosen for those who have allergies. The gloves can be used wet or dry. I tested out the gloves dry and as I pet my dog, he was a happy pumpkin while I was happy to see hair on the gloves versus my furniture. Next we moved on to the (always fun experience) of a good old bath. I, personally, have never been able to bathe the dog without getting a “bath” myself, but that’s part of the fun. As I began to lather up our baby, the gloves gathered hair and with a quick flick I was able to remove the hair from the gloves. All good! The best part for me was my ability to grab the shampoo bottle without having to remove the gloves. I was able to navigate through the entire bathing process without having to remove the gloves once! With the easy experience that I had with HandsOn Gloves Equine & Canine Grooming and Deshedding Gloves on our dog, I can only imagine the convenience that these gloves offer for those whom have horses. The grooming process truly was a bonding process! I have to note that the folks at this company are good people. They take care with their product, their animals and their customers. 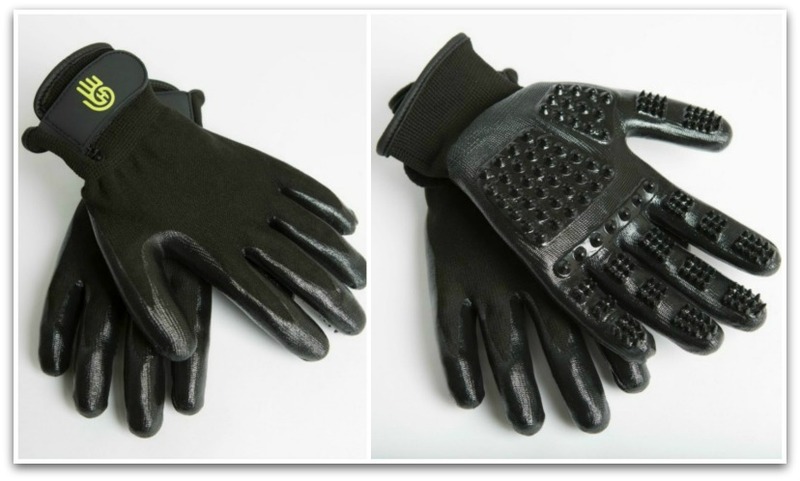 You can purchase your own HandsOn Gloves Equine & Canine Grooming Gloves online at HandsOn and visit them on Facebook!